Portrayed as unique, an immersive experience is a state of suspension, yet to be so, it has to permeate everything that is ordinary. At its peak you become passive, no matter how stirring its prelude. It is grand, but subtle; and, for digital artists achieving it, it means fostering a difficult mode somewhere between impulse and imagination. Having launched its sixth edition of the Société des arts technologiques Festival, the SAT continues to challenge our technical habits; this time through screening select pieces of “vidéomusique” and short films from around the world. Running from Jan. 8 to Feb. 8, the festival is one of several projects managed by the non-profit founded with a “double mission as a centre for the arts and research,” that aims “to support a new generation of creators/researches in the digital age”. 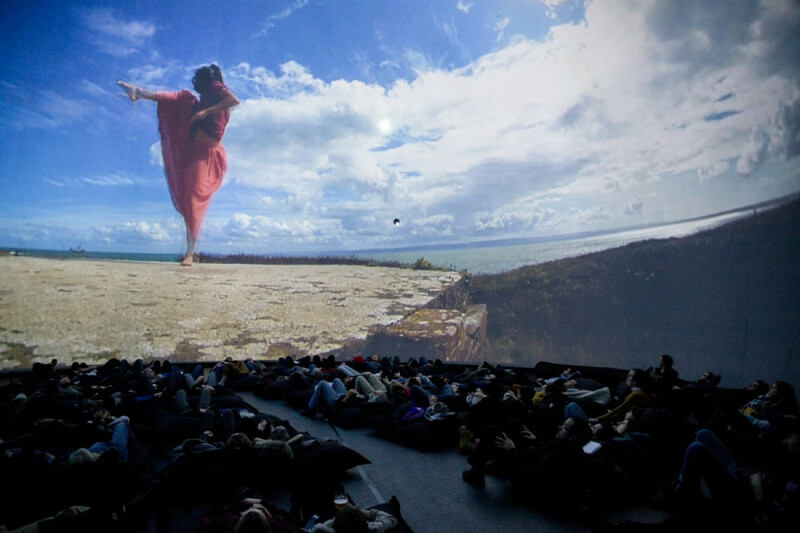 The screening room for the festival—the Satosphere immersion dome—illustrates the mission of the SAT in form and in content. 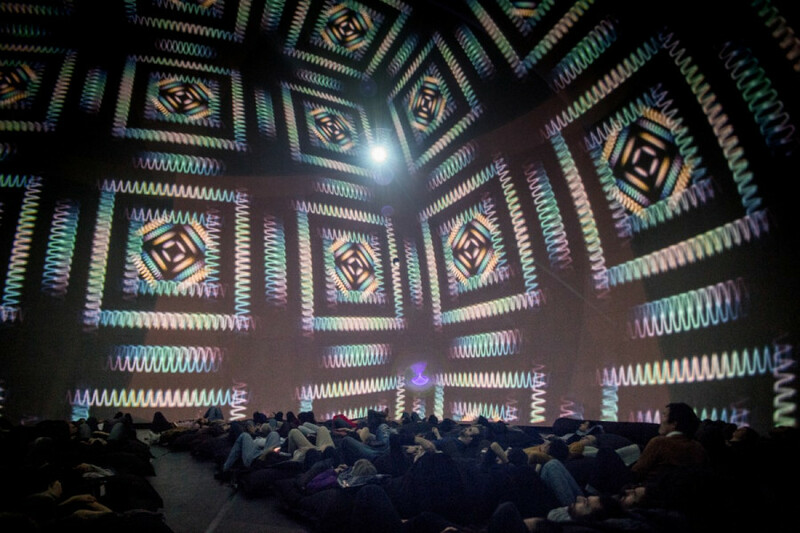 Some of the work being screened this year comes from artists employed by the society itself, suggesting that even as a theatre, the dome functions as a lab for artistic research before it is exhibited. Building on a collaborative foundation, she says “we are [our] own creators and our own researchers; we produce our own technology”—the 3D mapping program used in the immersion dome is just one example. This is in part due to the SAT’s attitude to planning, which Moïse describes as a form of creative free play, “all the while remaining scientific and traditionally artistic.” This multi-faceted approach results in a series of technology workshops for youth and adults, a culinary lab, and a concert venue among other features. More than half of the works exhibited at SAT Fest this year are self-aware. Four draw attention to material and manipulation, both concretely and conceptually. The concluding piece by Sean Caruso and Mourad Bncr, “Primitive” harks back to 1980s computer aesthetics. In response to a question about the synchronicity between sound and image, Bncr suggests it’s “‘80s done right.” The piece is electroacoustic, more reminiscent of a video game than ‘80s synthpop. Bncr “chose not to get any musical cues like ‘80s revival music”’ as it would deter from the goal of the piece, which was to pay homage to specific technology of the period. The piece leads viewers along a trail of baroque neon that sways and undulates beneath and above you. The “you,” of course, lies cushioned on a beanbag amongst several others, all trying to get the most of their single-sided perspective. It is comfortable, but impossible to maximize the experience, as the screen is a dome and you are a rigid body, unable to turn your head fast enough. Missing some details seems a part of the immersive experience. Fusako Baba, another fascinating artist, featured their piece “Hidden Garden,” which explores the unconscious. Facilitating a hypnotic flux, Baba provides the viewer with a series of azure organic ornamentations that hover in water, having semblance to the night sky. An optimistic vision of inner thoughts, it is a fantasy, but a soothing one. A series of lush ambient pieces, composed by Asako Miyaki, lends the montage a spacious texture, sharp and quartz-like, yet cavernous. Others stepped outside of the studio, as exemplified in the “Liminality” piece directed by Matt Wright and produced by Janire Najera. Featuring video footage from Wales and India, the artwork compares both landscapes and puts their cultures in conversation with one another through contemporary dance. The choreography by Kim Noble seamlessly accommodates the screening environment, allowing the fluidity of the dancers to encompass the theatre in sympathetic gestures. In its brevity and structure, the SAT Fest is a gentle introduction to the field of digital art. And while the wonder might also be a symptom of technical ignorance, the magic is important; only some of us are experts and those few need validation to continue stirring us. For more information about the SAT Fest, you can check out their Facebook page.